A very special Stanley came to visit today. He’ originally from Florida and is exploring different places. His mission was to learn all about a needlepoint store and the fabulously fun things inside. We had a great time letting him explore the store with the lime green walls. While he explored Bedecked and Beadazzled, we learned why Stanley is so special? He’s charming and mischievous and flat. That’s why. He immediately made friends with Modecai. Every shop needs a mascot don’t they? Look at that face; can’t you just tell he wasn’t prepared for a little boy with purple hair to peek around the corner of his shelf.? He has a new girlfriend. Aren’t they perfect for one another? We lost him for a few, and the next thing we knew he was spinning around not the thread racks. He thought that was lots of fun. It’s fun to play godzilla with a needlepointed store half your size. This is what happens when you hide in the flippy boards of canvases you risk getting flattened even more! What’s next? He’s a wild one. High up on the bead rack he jumped into a pile of vineyard silk. Perhaps its time for a nap? He had quite a day learning all the different threads and beads that we sell. Millions of colors to inspire creativity. I see another adventure in Stanley’s future. 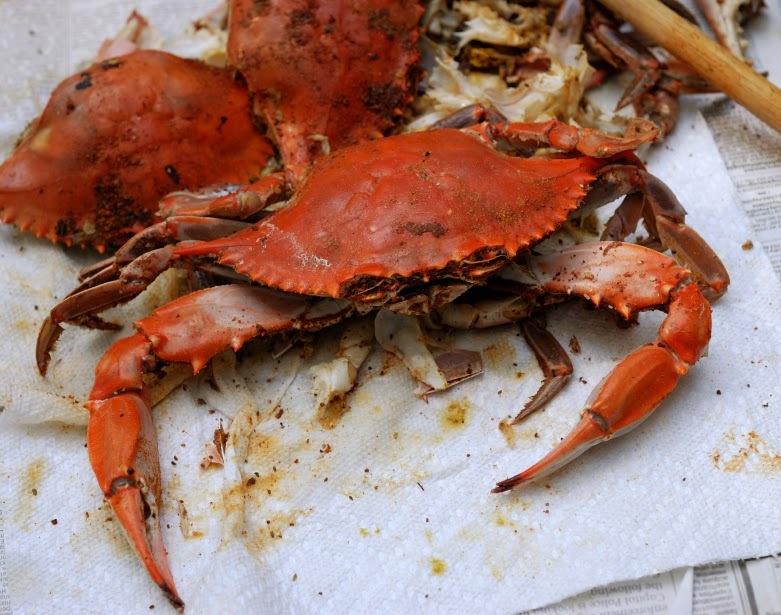 The kind of adventure that only happens in Baltimore – Steamed Crabs! Yum! Ruth, you and your team are the best!!! I can't wait to show the Princess! Thank you, all. K.B. Go Stanley! Wish we were all there with you, exploring. You probably can't reveal, but I assume you and some young friend/relative are having a lot of fun with a school project. Flat Stanley was well known in our family…..both kids and my niece. My niece sent Flat Stanley to CA to visit my brother's handsome bachelor friend, and Stanley had quite an adventure! Your post put a smile on my face. Enjoy!